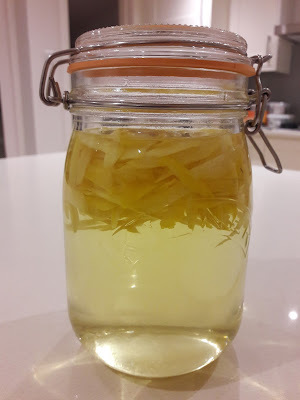 It's been a while - several years in fact - since I last made limoncello according to my friend Cloister's recipe. Then an unexpected surge of liqueur making two autumns ago - thanks to a glut of blackberries and grapes - reminded me of just how enjoyable it can be, and so here I am, once again, making limoncello this Lent. And yes, making an alcoholic drink during a season of fasting may seem counter-intuitive, but, as Cloister recommends, and I've discovered, it's actually a very good Lenten thing to do! The limoncello itself takes about forty days to infuse, the lemon zest gradually filling the liquid with its rich, vivid colour and clear, tangy flavour, sweetened by sugar. This photo was taken just after the process was started, with the sugary syrup blended in and everything floating so beautifully. By the following morning, the zest, weighed down by its own heaviness, had completed its inevitable descent to the bottom, already lined with a thin sediment of sugar granules. And that, of course, is very much how the Lenten journey can be for us. We begin, buoyed up by our desire and enthusiasm and good intentions, but - maybe not overnight, but certainly in the subsequent days and weeks - we can all too easily become weighed down, our sweetness separating from the sharp, instead of permeating it. Because of this, the limoncello can't be ignored for forty days: it needs to be shaken every few days, so that its ingredients rise and swirl and, uniting, bring out the best, the sweetest, the zestiest, in each other. And this can be a good moment to ask myself what, right now, needs to be lifted, even shaken up in me. What do I need to do, to return to my original enthusiasm and bring out the best in me? And gradually, just as I can see the sugar disintegrating and the liquid deepening in colour, I can begin to discern some change, some letting go, in myself. The final straining and perfecting - for the liqueur if not for me! - takes place during Holy Week, after which it's just a matter of waiting a few more days until the community Easter lunch, where I can share and enjoy the fruits of all my preparations. And if reading this has whetted your appetite at all, and you don't live anywhere near me - no problem, you're still in time to start your own, and have it ready to share at Easter!